Ground-level ozone, commonly known as “smog,” is the major summertime cause of poor air quality in the Bay Area. The Spare the Air Every Day program was created to reduce summertime ozone pollution. 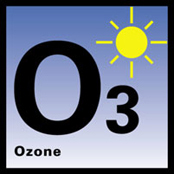 Ozone is essentially an unstable molecule made up of three oxygen atoms. It is created in the lower atmosphere by a combination of pollutants called reactive organic compounds and oxides of nitrogen that get “cooked” by the sun’s ultraviolet rays in a photochemical reaction. Ozone-forming pollutants emitted in one part of the region can affect other areas as they get blown around by local air currents and trapped by geographical features like low-lying valleys. At high concentrations, ozone can be dangerous to your health, inflaming the lungs and aggravating respiratory illnesses such as asthma. Long-term exposure to high levels of ozone has been linked with the development of asthma in children.